Soccer moms drive Priuses. Sport utility vehicles are going hybrid. Families are using hemp shopping bags. More and more companies are developing "green" buildings. What's more, the business consultants say going green is easy and profitable. In reality, though, many green-leaning businesses, families, and governments are still fiddling with the small stuff while the planet burns. Why? Because implementing sustainability is brutally difficult. 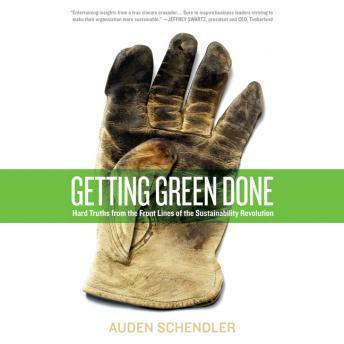 In this witty and contrarian audio book, Auden Schendler, a sustainable business foot soldier with fifteen year's worth of experience, gives us a peek under the hood of the green movement. The consultants, he argues, are clueless. Fluorescent bulbs might be better for our atmosphere, but what do you say to the boutique hotel owner who thinks they detract from his? And how do you convince a chain-smoking karate expert mechanic to put biodiesel in his vehicles? Scientists tell us we have to cut CO2 emissions 80 percent by mid-century. That's going to take more than a recycling program. We'll only solve our problems if we're realistic about the challenge of climate change. In this eye-opening inspiring audio book, Schendler illuminates the path. This recording features a new introduction wriiten and read by the author. Also, a new Afterword based on an article written by the author for Orion Magazine has been added to this recordig. "The sobering conclusion that I have reached after traveling to Germany, the UK, Japan, and several U.S. states, is that even the greenest nations are not planning anything like what is needed-they say some green words, but their actions don't match the scale of the problem. Getting Green Done defines strategies that will actually help. It's an antidote and an alternative to 'greenwash,' the fraud perpetrated by governments and the fossil fuel industry that threatens our planet and our children."